Calathea crocata, commonly called Eternal Flame Plant belongs in the Marantaceae family and is only one of 300 different species of Calatheas. 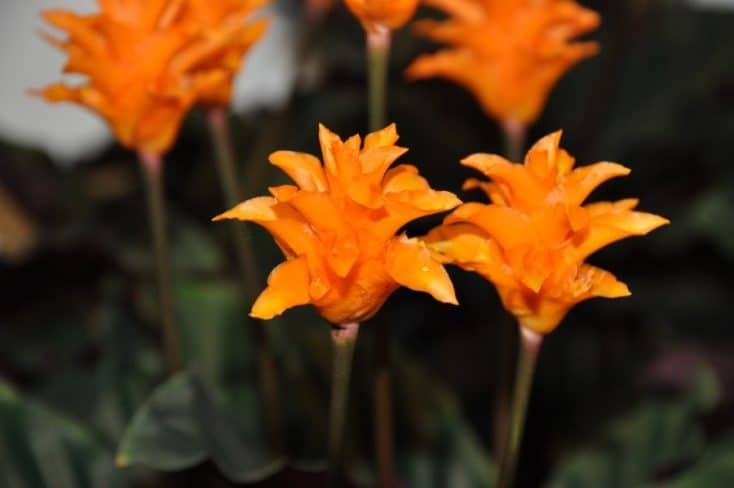 With proper care, the tropical plant adds a splash of indoor color with its lush foliage and bright orange-yellow blooms resembling a flame, thus its common name. Here’s a quick summary of its care with further details outlined below. 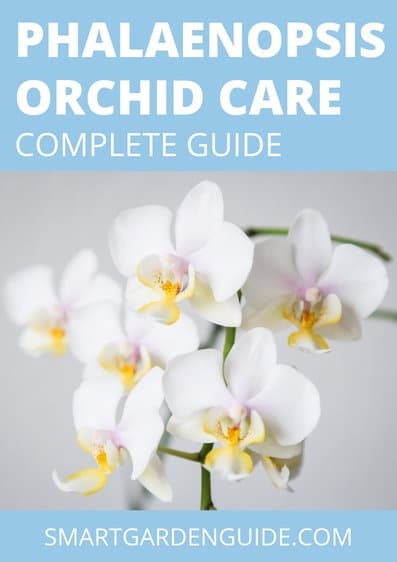 How to care for Calathea crocata: Grow Calathea crocata plants in a rich, well-drained soil situated in a humid environment with indoor temperatures ranging between 65°F to 80°F. Water when the top inch of soil becomes dry and fertilize monthly. To keep your Eternal Flame Plant happy and thriving, continue reading for all the specific details and tips on its care and keeping any potential problems at bay. How To Care For Calathea Crocata? 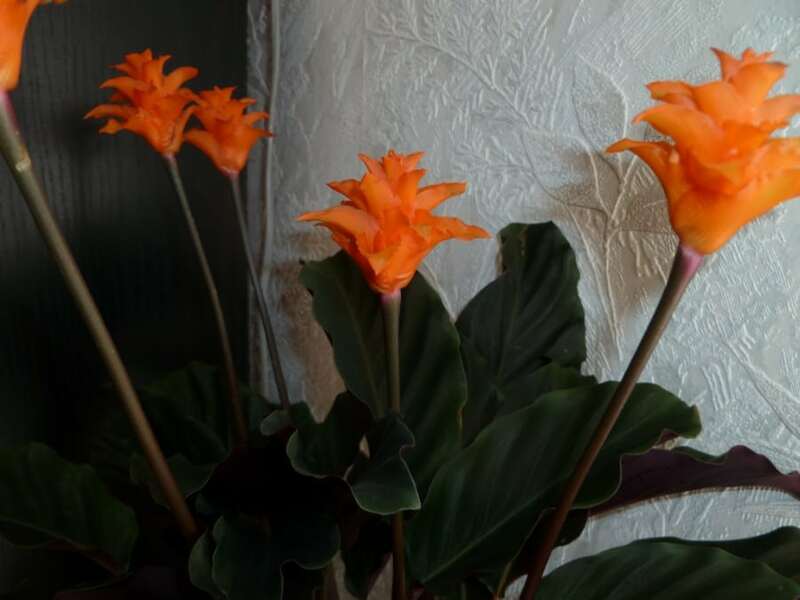 Calathea crocata is native to the jungles of Brazil and Central and South America, making its way to Hawaii in the 1970s, so it’s a relatively new houseplant, compared to some of the other plants that thrive indoors. 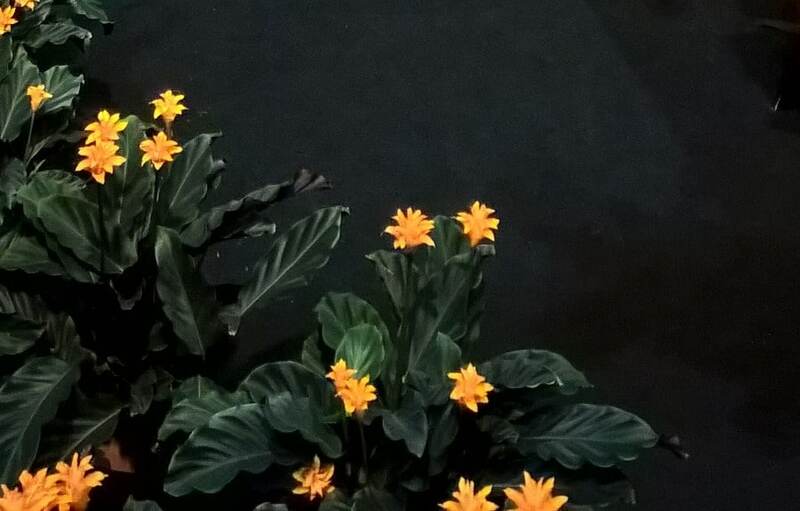 In its native habitat, it resides on the jungle floor, basking in humidity and indirect light and these conditions need to be replicated indoors for the Calathea to thrive and produce healthy growth. When its proper conditions and care are met, Eternal Flame Plant can be considered easy to care for. However, when it’s not cared for properly or it’s grown in less than ideal conditions, it can turn into a fussy plant, giving you a big headache as you try to figure out what’s wrong and correct the problem. The best solution to avoiding potential problems is meeting your Calathea crocata’s requirements from the moment you bring it into your home. For the best performance and growth, grow Calathea crocata in a fertile, lightweight potting mix that contains some peat. Don’t use a straight potting soil as many times the mixture is too heavy and retains too much water leading to rot. In its native environment, the plant grows on the forest floor in leaf litter and debris. You can make your own potting soil by mixing about 25 percent peat moss with 75 percent compost or a potting mix that is rich in organic materials. Just make sure your mixture is lightweight, drains well and isn’t too heavy. For the best growth, color and production of flowers, situate your Eternal Flame Plant in a location indoors receiving bright indirect light. A south-facing window generally produces too much direct sunlight, but using an east-, west-, or north-facing window is an ideal location. When placed in an indoor location that is too sunny and receives direct sunlight, the plant can suffer burned foliage and the foliage loses its color. However, during winter, it can endure a bit more light than during the hot summer months when the sun is more intense. Calathea crocata’s native habitat is warm year-round. Therefore, it requires a warm environment when grown indoors. Temperatures ranging between 65°F and 80°F are ideal. In addition, the plant doesn’t tolerate sudden extreme changes in temperatures or draughts. Even indoors, when temperatures dip below 55°F your Eternal Flame Plant can suffer damage from excessively cold conditions. On the other hand, if your indoor temperatures become too hot, the foliage starts curling. If you desire, once your weather warms in spring and summer, you can give your plant a break from growing indoors by placing it outside in a shady location. Care for it as you would while it’s growing inside your home. 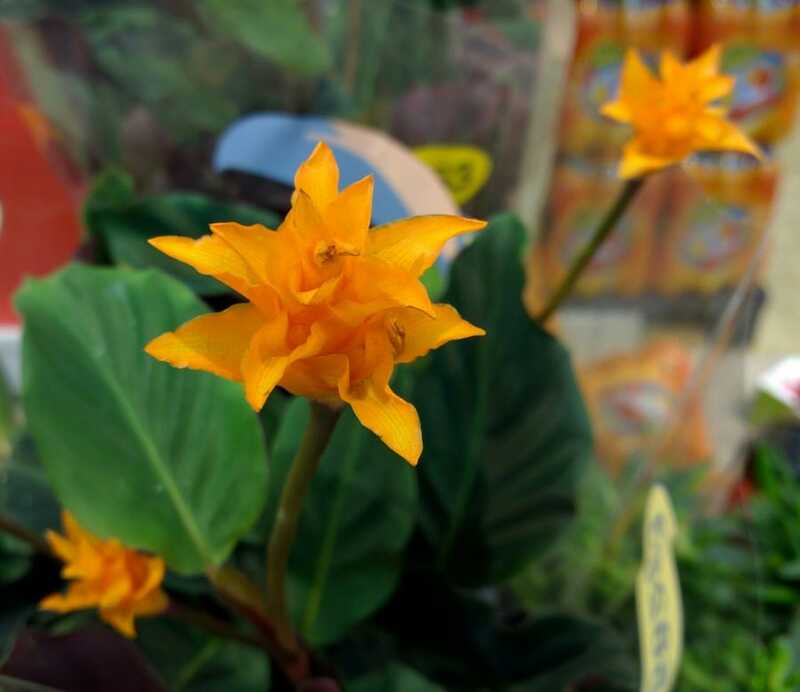 Calathea crocata grows best with regular applications of water, especially during the warm growing seasons of spring and summer. Irrigate when the top inch of soil becomes dry, using enough water so that it runs from the pot’s bottom drain holes. This will amount to around once weekly. In winter, you may only have to water every two weeks. If you have hard, soft or fluoridated water, allow it to sit out at room temperature overnight before using. However, you can directly use distilled water or rainwater collected from the garden. Never allow the plant to sit in standing water or root rot can develop. If you have the pot with drain holes sitting inside a decorative pot, be sure to empty it of any water after the soil has completely drained. To keep your Calathea crocata from getting homesick for the jungle, it’s very important you create a humid environment for it to live in. It thrives in high humidity and sufferers problems if conditions aren’t humid enough. Fill a spray bottle with room temperature distilled water, rainwater, or tap water left out overnight and mist the leaves every other day to daily. Don’t mist the flowers and don’t use cold water. You can also sit the pot on a tray of pebbles that will collect the water that runs from the pot’s bottom drain holes. Situate the plant in a bathroom that receives adequate lighting. Remember, these are jungle plants so they can’t have too much humidity. Eternal Flame Plant isn’t a big feeder but will benefit with fertilizer applied every other month during the growing seasons of spring through summer. The plant goes through a dormant period (growth slows) during winter, so there’s no need to fertilize. Use a water-soluble, houseplant blend applied at half-strength and apply when you water. To remove any buildup of soluble salts from the fertilizer, drench the soil every few months. This is as easy as taking the pot to the sink and allowing tap water to flush through the soil at a gently stream. You also have the option of using time-released granules spread on top of the soil. This type of fertilizer gradually releases the product every time you water. Follow the particular product’s package directions on amounts. If using a time-released fertilizer, you will probably only have to feed the Calathea crocata one each season in springtime. Calathea crocata doesn’t have large needs when it comes to pruning. However, it’s best to trim off the foliage as it dies naturally, trimming back to the base. You can also remove any diseased or damaged leaves, as they won’t correct themselves. You also have the option of trimming off the damaged section of the foliage so it doesn’t show or take away from the plant’s appearance. You can also trim off the long flower spikes once the blooms are spent, trimming the spike off close to the base of the plant. The last thing you want to do is transfer any pests or diseases to your Eternal Flame Plant, so be sure to use sterilized pruning tools to do any trimming. Cleaning your pruning tool blades is as easy as wiping them off with rubbing alcohol or using a household disinfectant. Allow the product to dry before using on the plant. Unless you purchase an extremely large Calathea crocata that’s growing in an extremely small pot, you don’t have to worry about repotting for a year or so. Any type of material for the container works well as long as it has bottom drain holes. Although, pots made of materials such as terra cotta will have the soil drying quicker than the soil in plastic pots. It’s generally time to repot into a slightly larger container if the plant is getting too big for the present container and tipping over, or the root system has started to wrap in circles. Allowing the root system to stay wrapped can negatively affect the plant’s growth and if the problem is too bad, the plant may never recover proper growth. Select a new container that is slightly larger than the present one. Choosing a pot that is too large can result in the soil retaining too much water and opens the plant up to rot. Gently remove the Eternal Flame Plant from the present container and inspect the root system for wrapping. Gently pull the roots apart, if needed. Fill the new container about a quarter full of a rich potting mix that drains well. Place the Calathea crocata in the center of the pot and fill the remainder with soil, packing it around the plant’s base with your fingers. Water until it runs from the bottom drain holes and then situate the plant back where it was originally growing. Eternal Flame Plant flowers off and on throughout the year, with blooming the heaviest during summer. The orange-yellow flower bracts are born on stalks up to 2 feet long, with the true tubular-shaped, orange-yellow flowers with red sepals are almost hidden among the colorful bracts. The blooms are long-lived, lasting for two to three months. The biggest care of the flowers is keeping water off them when you mist the foliage to create humidity. You can also force the Calathea crocata to bloom by creating the artificial conditions that naturally promote blooming. The plant flowers naturally when days are short and nights are long. The appropriate time to force blooming is around the middle of August. Around 6 p.m., place a black polythene bag that is large enough to cover the entire plant without damaging it, over the Eternal Flame Plant. At around 8 a.m. the next morning, remove the bag from the plant and allow it to receive natural light throughout the day. Replace the bag nightly until you start to see flower buds forming, which you should start seeing them develop sometime in September. Once the flower buds are noticeable, discontinue using the black bag. This allows the Eternal Flame Plant to receive about 14 hours of darkness each day. When it comes to propagating new Calathea crocata plants, you simply divide the thick tuberous roots, creating additional plantings. The best time to do this job is when you are repotting the entire plant in spring or summer and while it’s actively growing. Gently pull the roots apart, being sure to get at least one leaf and a healthy section of root system with each section. Plant each section into a pot filled with a fertile, well-drained potting mix, planting as deep as the section was originally growing inside the original pot. Don’t plant the sections too deep into the soil mixture or they may rot. Keep the potting mix damp but not soggy with water and place the newly planted sections back in the same conditions where it was originally growing. Two common pests that can affect Eternal Flame Plants grown indoors are spider mites and mealy bugs. Both are sap-suckers that damage the plant by sucking out the plant’s juices. If left uncontrolled, the insects can severely damage the plant and if the infestation is large, can lead to the plant’s death. The insects can also travel to other plants you are growing indoors, making the problem even worse. Identifying a problem with either pest is relatively easy. Spider mites are very small and live in large colonies usually infesting the underside of the plant’s foliage. However, if the infestation grows large, the tiny mites will also infest the top side of the leaves. You can easily identify a spider mite problem by the fine, white webbing the mites spin that cover the plant. Mealy bugs are closely related to scale insects and attach themselves to newly developed leaves and stems. You can identify a mealy bug problem by the cottony mass that develops along fresh stems. Quickly treating the pest problems is essential for the health of your Eternal Flame Plant and any others you are growing indoors. Products that control the pest infestation include using a horticultural soap spray or Neem oil. Cover the plant’s foliage with the product and reapply at the rates and frequency suggested on the particular product’s label. If the infestation isn’t too large and you catch it at its start, you can also wipe the pests off the plant’s leaves and stems with a damp cloth. The plant’s requirement of a humid environment opens them up to several fungal and bacterial diseases. Pseudomonas leaf spot shows up as water-soaked lesions on the plant’s foliage that are usually black or dark green. Spraying with a copper-based fungicide usually corrects the problem. Pseudomonas blight forms as water-soaked areas along the leaf veins, quickly spreading throughout the affected leaf and turning papery brown. There is no cure for this disease and to keep it from spreading to your other indoor plants, it’s best to remove the Eternal Flame Plant and destroy. Alternaria leaf spot shows up as yellow or brown spots on the plant’s leaves with a circular ring eventually forming around the spots. The problem is caused by the foliage remaining wet for long periods. You can correct the problem by not watering overhead and at the base of the plant, and spraying the plant with a copper-based fungicide. Fusarium wilt is a fungal problem affecting the soil and shows by the foliage yellowing and eventually wilting. The best course of action is to remove the Eternal Flame Plant from the pot and wash the infected soil from the plant’s roots. Wash the container with soapy water and repot with fresh, sterilized potting mix. Treat the plant with a copper-based fungicide for several weeks after replanting. How Often Should I Water My Calathea Crocata? The frequency of water applications for your Calathea crocata depends on the container’s material and the indoor temperature, as a terra cotta pot might require more frequent water applications than a container made out of plastic. However, you will probably water the plant weekly during the growing season and cut back the water applications to about every other week during winter when the plant isn’t actively growing. Stick your finger into the soil and if the top inch is dry apply water. When Can I Repot Calathea Crocata? Depending on your particular plant’s size and the size of the container, you probably won’t have to repot but every year or two. If the plant has outgrown its pot or the root system has begun wrapping, it’s time to repot, which is best done in spring or summer. When repotting, select a container that is only slightly larger than one the plant is presently growing in so you prevent overwatering the soil leading to rot. Just make sure the new container has drain holes and use a fertile, well-drained potting mix. How Do I Clean Calathea Crocata’s Leaves? Keeping any dust buildup off your Calathea’s leaves keeps the plant healthy and allows the foliage to breathe properly. Periodically checking your plant’s foliage when you water and removing any dust prevents the problem from building up. Although there are various leaf shine and cleaning products on the market for doing this job, you can also easily do it by gently wiping the foliage off with a damp cloth. What’s Causing Dead Spots On The Leaf Margins? This is a problem generally caused by fluoride toxicity. Solve the problem by avoiding using water or fertilizer container fluoride. Why Are My Calathea Crocata’s Leaves Losing Their Color? The plant’s leaves can lose color by overwatering, light levels that are too bright, or lack of fertilizer. Correct the problem by reducing the frequency of water, moving the plant to a location with lower light levels and applying a fertilizer at half-strength monthly. Why Are My Healthy Looking Calathea’s Leaves Wilting? If the foliage on your plant looks healthy, the problem is lack of water. Increase the frequency of water applications by applying water when the top inch of soil is dry to the touch. 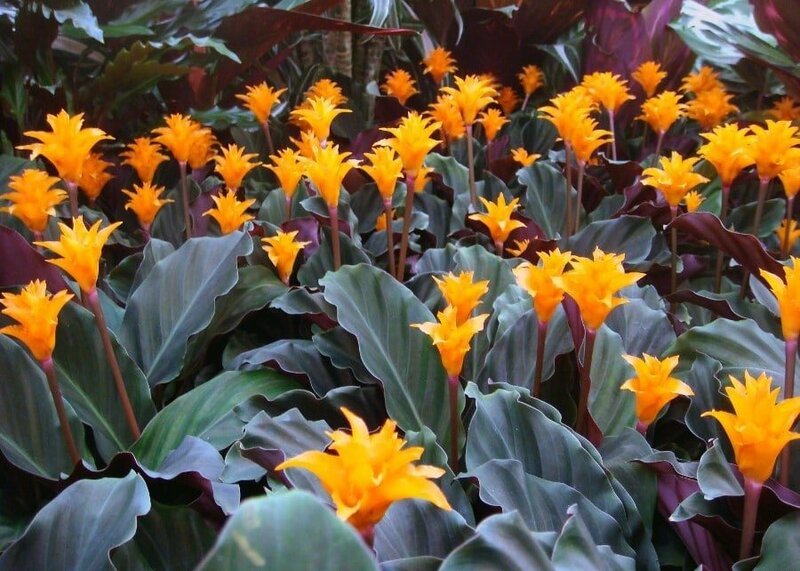 Calathea crocata is considered non-toxic to dogs, cats, horses and people.